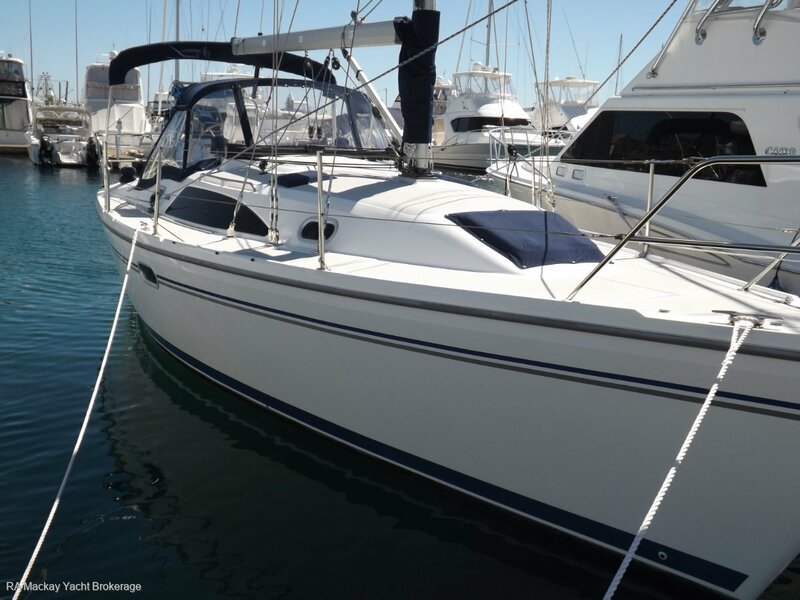 The best cruising yacht available in the 30' range, this boat is in 'as new' condition, low engine hours, fully optioned, professionally maintained and marina based. Will suit a new boat buyer; she is turn key and ready to sail. Phone our office on 0249505706 to arrange an inspection by appointment. Autostream self feathering 3 blade prop (prop speeded). Spare original 3 blade, bronze proprellor. Seaward heater System/tank, runs off engine and shore power. Forward cabin double V berth forward, head shower, dinette with two settee saloon berths, convertible main saloon table, galley to port, nav to stbd, double cabin aft. Has dinette cushion insert to form an extra double berth in the saloon. White Ultra-leather upholstery. Two-hot and cold including transom. Has full range of covers including full deck, instrument, wheel, deck hatches, furler drum, mast gooseneck, dodger, bimini, solar panel, instrument table, winches, all in good condition. Muir Electric anchor winch;30lb Mawson plough anchor with chain and rope warp approx 40 m. .
Two inflatable and two foam life jackets, fire extinguishers x2, flare kit, fire blanket, flashlight, emergency tiller, vsheet, throw line. Compass, 2 horseshoe life rings with lifebuoy lights/holding brackets. GME MT600 EPIRB. Manual bilge pump and handle. Fenders, boat hook. Horn. 2 banks Batteries (2014) with battery charger; 2 Solar panels with hinged support brackets and solar charge controller;LED lighting in cabin area, 240v Shore power and galvanic insulator. Furling genoa and furling mainsail (with vertical battens) new 12/2015 manufactured by Bull Sails. Genoa 702 Blue Water Cruise dacron with Sunbrella UV Cover; Storm Jib, (Original main and genoa included as spares). Selden Double spreader in-mast furling main with genoa furler. Seldon Vang system. All standing and running rigging replaced in June 2016 by Bob Fussell Marine. Lewmar winches: 40 S/Tx2;30S/Tx2. Cockpit cushions. Lewmar folding wheel, hide-covered. Full set of cockpit cushions, telescopic swim ladder. Looking for a new boat, with all the gear and run in? Come and check this one out by phoning owners' exclusive agent and Catalina specialist broker Rod Mackay on 0419633345 to arrange an inspection by appointment.